I have been invited to my first official Thanksgiving dinner. Or is it lunch? It’s still unclear in my head as the invitation is for 4 in the afternoon and the “presentation of the bird” will be around 6pm. So that makes it a late lunch or early dinner I guess. 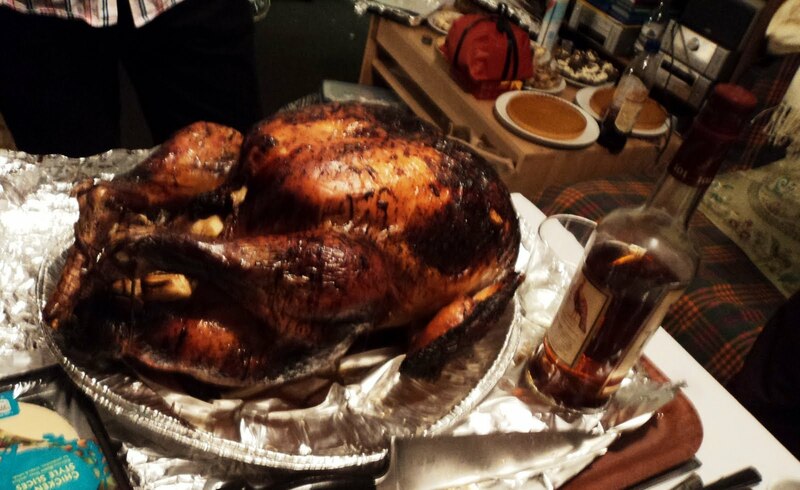 In any case, my university friend, the Cruise Guy invited us to his house for Thanksgiving. I am looking forward to going as I’ve only been to a Thanksgiving dinner once, a few years ago at a magnificent hotel with Mr N.
I offered to bring something thanksgiving-y, something that I’d never prepared before. So this week’s challenge dear reader is something that for many of you may be simple but for me is not. For the first time I am making Mashed Sweet Potatoes with Banana and Brown Sugar. I have only tried cooking sweet potatoes once and the result was a very interesting sweet puree which tasted, as obviously one would expect, like a potato that is sweet. 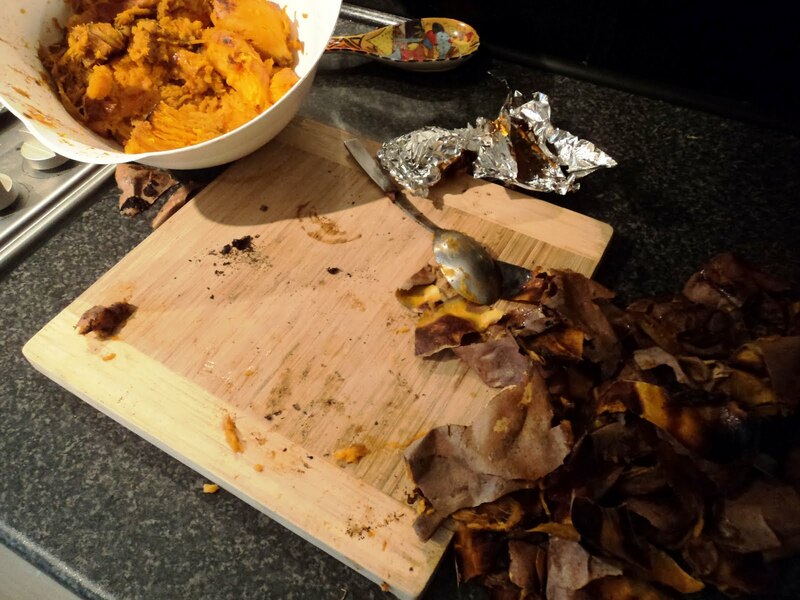 The issue that I had encountered then was that the sweet potatoes became black as soon as you peeled them and they came in contact with the air. And I do not mean the usual “apple becomes dark-you have to put it in water with lemon” because let’s be frank, apples can stay for a while without water and lemon. But these sweet potatoes clearly needed extra attention. With that in mind I wear my Blue Elephant apron, arrange my ingredients and pray that the Americans who will taste the Greek girl’s sweet potatoes will be dazzled. It’s Adam Perry Lang’s recipe-how can it go wrong? Wash the sweet potatoes (approx 2.4 kg) and place them in a baking tray – no oil or anything. Wrap an unpeeled banana in tinfoil and add to your tray. Bake for an hour or so at 180 C until they are nice and soft. Remove from oven and peel them in a large bowl, scooping out any flesh. Peeling them when hot makes it easier to remove the flesh I think. Also peel the banana. Mash with a potato masher. In a pot, place a cup of double cream, 8 tablespoons of salted butter, ¼ cup of sugar and a few pinches of cinnamon and black pepper. Stir in a low heat until sugar dissolves. 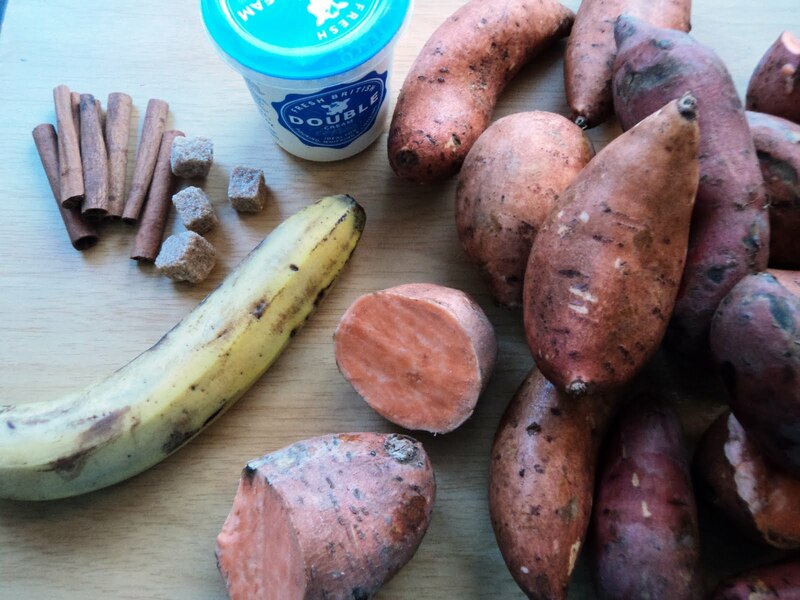 Now, you want to mix sweet potatoes/banana with the cream and blend so that you have a nice smooth puree. But you need to be careful not to use too much cream. Blend in batches, adjusting cream accordingly. You want a smooth, orange looking creamy puree. Taste and adjust for salt, pepper and cinnamon. If you wish to be a bit more playful with the texture do leave a few lumps. A few hours later, sitting on the tube, holding the bowl with the orange mash on my lap, I am thinking that this year, maybe more than ever I am grateful. 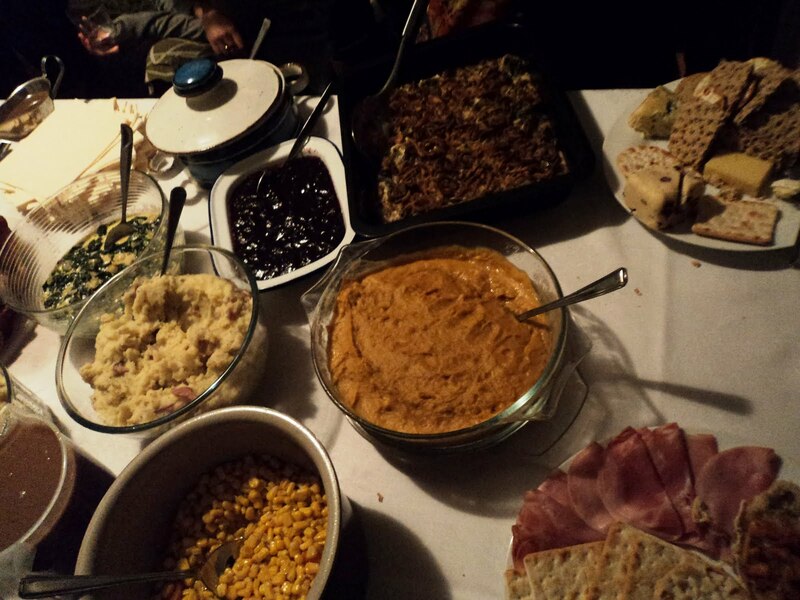 I am grateful because the mashed potatoes taste amazing, grateful because Mr N offered to clean up the entire kitchen and I didn’t have to lift a finger. But most importantly, I am grateful because I took the leap of faith, jumped and now I’m happier than ever, living in London, reading, writing about food and, of course, cooking anything, cooking everything.